The NBA playoffs begin this weekend, with every Game One coming on Saturday or Sunday. This year's playoffs revolve around one central storyline: Can anyone stop the Golden State Warriors? 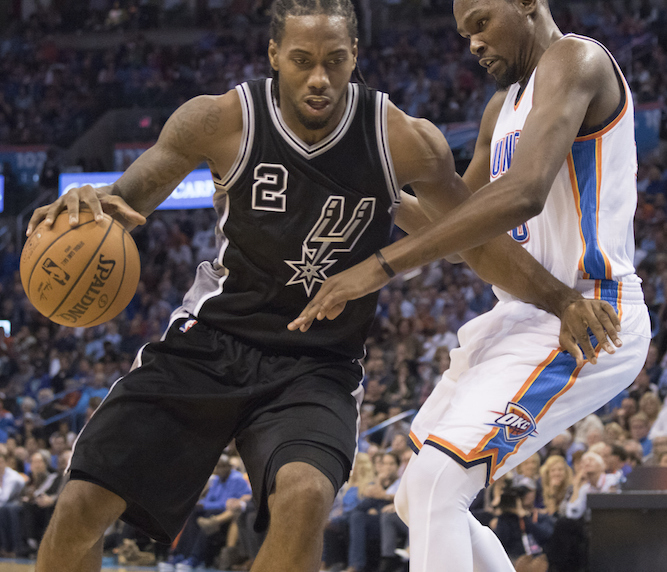 The San Antonio Spurs, their in-conference rival, seem like the best challenge. But LeBron James' Cavaliers will undoubtedly want revenge for last year's Finals. The Pistons have exceeded all expectations, as few thought they would be in the postseason in the second year of a rebuild. A midseason trade for forward Tobias Harris transformed the team. He averaged 16.6 points in 27 regular season games with the Pistons. The Cavs are expected to go small by starting Tristan Thompson at center. Stars LeBron James, Kyrie Irving, and Kevin Love figure to be well-rested coming into this series. The Pistons will rely on scrappy defense and balanced offense to slow down the Cavaliers. Cleveland isn’t as strong on defense, but they have obvious offensive star power. I predict that the Cavs won’t be able to walk all over Detroit, but will eventually prevail in five games. The Pacers are back in the playoffs after being derailed last year by Paul George's horrific leg injury. Last season they finished with their only losing record in the past five years. Toronto went 56-26 this season, putting Dwayne Casey in the conversation for coach of the year. The superstar backcourt of DeMar Derozan and Kyle Lowry makes it happen for Toronto. Besides those two, though, the Raptors don’t have any consistent scorers, which is a concern in this series. Indiana is a gritty, defensive-minded team that will try to slow down the Raptors’ fast-paced offense. Still, I think the Raptors’ duo will score too much and pull it out in six games. The Celtics have proved skeptics wrong in the third year of the Brad Stevens-era. They won 48 games this season, earning their second straight postseason berth. Without a single superstar, the Celtics boast a very balanced offense. Despite a frenzy of trade rumors at midseason, the Hawks decided to keep their team together, and it has paid off. Atlanta rose to fourth in the East after sitting around seventh and eighth. Forward Paul Millsap is averaging 17.1 points this year, which leads the team. The Celtics usually love to go small to spread out the floor. Many of Boston’s bigs can shoot, which should present a matchup nightmare for Atlanta. For that reason, I think the Celtics will win this series in six games. Miami will again be without Chris Bosh due to blood clots. After several key injuries, expectations for the Heat were low. But the signing of Joe Johnson and the emergence of rookie Josh Richardson have made a huge difference. Johnson has averaged 13.4 points since arriving in South Beach, while Richardson has shot 45.6%. The Heat love to play slow, while the Hornets rely more on pace for their offense. The Heat depend heavily on veterans — a blessing and a curse. They have a lot of experience, but the young Hornets could push the tempo and give the Heat trouble. Ultimately, however, I predict the Heat succeed in slowing things down and win in six games. The Rockets have been the league’s most disappointing team, finishing below .500. The Warriors on the other hand — well, you know. Both teams can score, but defense separates them. The Warriors apply constant pressure, while the Rockets have struggled mightily on defense all year. The Warriors offense, which ranks first in the league, will be a huge matchup nightmare for the Rockets. The Rockets need James Harden at his best if they want to even compete with the Warriors. Unsurprisingly, Golden State won the season series 3–0 this year. I think Harden’s scoring wins one game for Houston, but that’s all. The story of the Grizzlies season has been injuries. They have had to use an NBA record 28 players, and two of their top scorers from last year (Marc Gasol and Mike Conley) are out. Despite being ravaged by health problems, Memphis somehow managed to finish with a winning record, 42-40. The Spurs, on the other hand, went 67–15 and have a real shot at derailing Golden State’s repeat hopes. Memphis has no shot with their injuries to compete with San Antonio, which is why the Spurs will sweep the series. After losing four starters in the off-season, no one expected the Blazers to compete. But they exceeded expectations big time by finishing fifth in the Western Conference. Like the Raptors, the Trail Blazers are led by their backcourt. Damian Lillard averaged 25.1 points, while C.J. McCollum did 20.8 per game in a breakout season. But after those two, Portland doesn’t have many threats to score. With Blake Griffin back from his hand injury, the Clippers will be very tough to stop. It’s been a great season for the Blazers, but it will come to an end after six games against the Clippers. The Oklahoma City Thunder are back in the playoffs with basketball’s best one-two punch: Kevin Durant and Russell Westbrook. But the big problem for the Thunder is the rest of their team. Dallas should just be happy to be back in the playoffs after the disappointing off-season in which they missed on signing DeAndre Jordan. And even though the Thunder lack secondary scoring options, beating Durant and Westbrook four times will be awfully tough for Dallas. I think the Thunder easily beat the Mavs in five games.